Cooking in a Tandoor is one of the traditional way Indian cooking. Traditional Tandoor is made of clay and charcoal is used. Cooking roti, nan, chicken, mutton in tandoori oven has a different taste due to clay and fumes from the spices dropping in the charcoal while cooking. 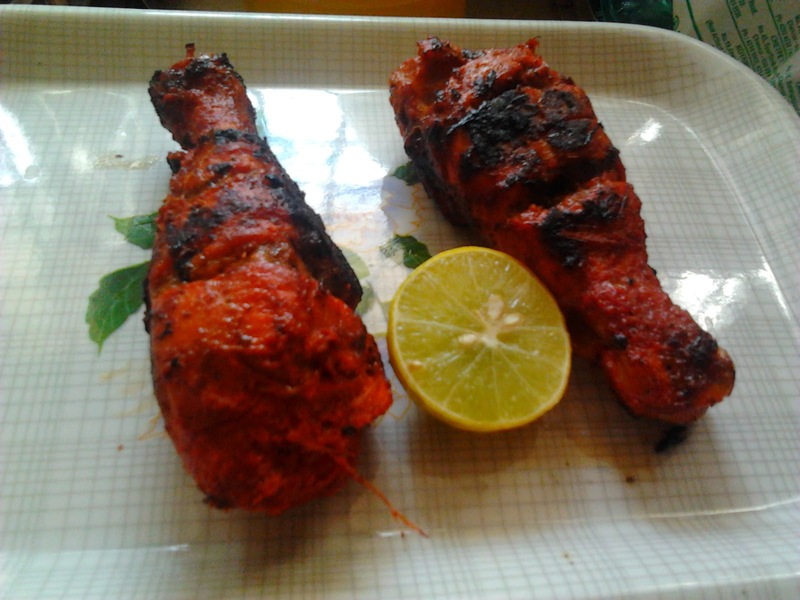 Tandoori chicken is a famous dish seen in most of the Indian, Pakistani and Bangladeshi restaurants prepared with whole chicken/chicken legs/chicken drumsticks/chicken breast marinated in a spicy batter containing yoghurt/curd, Indian spices, pepper powder and lemon juice. Chicken should be marinated for atleast 12 hours which will give you a perfect taste. A best starter with a smoky flavour tandoori chicken can be cooked in OTG or in a hot plate. Try this mouthwatering recipe and Enjoy Cooking!!! Red chili powder 2 tsp. 1. Skin out the chicken and make incisions all over diagonally. 2. Mix 1 tsp red chili powder, salt and 2 tsp lemon juice. Apply this over the chicken and leave it for half an hour. 3. Hang Curd/Yogurt in the muslin cloth for some time to drain water content. Mix Yogurt, red chili powder, salt, lemon juice, Ginger Paste, Garlic Paste, pepper powder, Garam Masala Powder and mustard oil in a bowl. 4. Apply this marinade to the chicken. Refridgerate the chicken for 2 to 5 hrs. 5. Put the chicken onto the skewer and roast in the tandoor oven or OTG. 6. When chicken is almost done, baste it with oil, roast again till done. 7. Sprinkle some pepper powder and Serve hot with onion slices and lemon wedges.